The new MP 6055 series complements the MP 2555 series in Ricoh's black-and-white MFP product line. This series consists of three devices that allow standard printing, copying and scanning, and optional faxing. First, there is the MP 4055 (12,619 US dollar), which copies and prints with 40 pages. It has a first time of 7.9 seconds. Then there is the MP 5055 ($15,169), which runs at 50PPM and has a first-page-out time of 8.2 seconds. And finally, there is the MP 6055 (19,495 US dollar), which has a print/copy speed of 60 pages per minute and an initial output time of 8.7 seconds. All three multifunctional processors have a 1.46 GHz processor, 2GB of memory, and a 320 GB hard drive. There is also a 10.1-inch smart control Panel with frequently called workflows that appear as icons. As with a smartphone or tablet, users can swipe through the screens, drag, and drop, or swipe and scroll. Workflows can be customized by downloading them from the Ricoh app site. For more details on handling paper and other functions, see the following functions section. The MP 6055 series continues Ricoh's tradition of providing powerful features for larger companies that need a multi-function, but no color output. 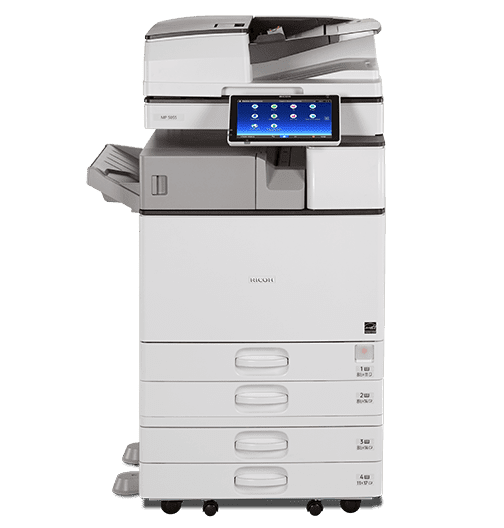 Combine high-speed performance and end-to-end document production with the Ricoh MP 6055 Black and white Laser Multifunction (MFP). Use custom automated workflows, shortcuts, mobile comfort, optionally advanced editing, and much more to perform common tasks with exceptional speed and precision. Add paper sources to extend the capacity to 4,700 sheets and to perform longer production runs in less time. Print and copy black and white output with up to 60 pages per minute (ppm) and a robust processing speed of 2 GB of RAM. Use the single Pass document feeder (SPDF) to scan one-or two-page originals with up to 180 images per minute (IPM) and instantly share digital files with scan-to-email, FTP, PDF, URL, or even optional paperless faxing. With our WorkStyle innovation technology, you can execute tasks immediately on the 10.1 "Smart operation panel. Simply navigate through the touchscreen interface of your choice and take advantage of the numerous functions for printing, copying, scanning or faxing for a precise control browser you can also access information from websites or cloud applications and print them on the device or save them to storage media. Create automated workflow shortcuts by downloading apps from the Ricoh application site. Use the ID card scan & copy the app to scan two-page originals on one side of a sheet of paper. Use the How-to Videos app for step-by-step instructions. Use the Conference Concierge app to simplify the creation of documents with easy-to-follow contains. Impress the audience and eliminate the cost of outsourcing through optional stapling, punching and booklet for sizes up to 11 "x 17". Use the internal, space-saving multi-fold unit to automate different types of Falzjobs. Choose the 1,000-blade hybrid stitch Device + Stapleless finisher for automatic, Hefefreie refining of documents with five or fewer pages-ideal for schools, hospitals, and offices where security and recycling are particularly important. Download widgets, check settings and more on the main screen. Add software from Ricoh and third-party vendors, including Ricoh Streamline NX ®, Ricoh Global Scan ™ NX, or Nuance ® AutoStore ®, to reduce manual recurring tasks. Use Ricoh @Remote to automate counter levels and accelerate proactive maintenance calls. Access up to 3,000 files on the document server for on-demand printing. Search for PDF files with a keyword search when you add the optional optical character recognition (OCR) scanning. Download the Ricoh Smart Device Connector app with your smartphone or tablet to get information from Dropbox ™, Office365 ™ and other cloud applications using the optional Ricoh Integrated cloud environment and the Ricoh Google Cloud Print app at MFP device. You can also print via AirPrint ®. Simply connect to the smart operation panel via the Near Field Communication (NFC) tag to authenticate you. You can also scan originals directly onto your phone and take them with you. With user authentication, you can track activities and users, set print quotas, and keep jobs on the device for safekeeping. Add the optional Ricoh Device Manager NX accounting software to give people and work groups chargebacks. Reduce risks with automatic encryption and tools for overwriting latent data. The MP 6055 is Energy STAR ® Certified, corresponds to the EPEAT ® Gold criteria and offers a typical power consumption of 2.6 kWh/week. For even more savings, program the MFP automatically when you're out of the office and set duplex printing as the default to save paper costs.